Did Collision Cause Japanese Probe to Miss Venus? A Japanese probe that failed to enter orbit around Venus Mondaynight (Dec. 6) may have been damaged by an impacting object, according to newsreports. Alternately, a problem with the spacecraft's engine nozzlecould also be to blame for the probe's wayward journey. The Akatsuki spacecraft, whose name means "dawn"in Japanese, is currently speeding away from Venus after failingto insert into the hellishly hot planet's orbit. But the probe will comeclose enough to make another attempt in late 2016 or early 2017, and officialswith the Japan Aerospace Exploration Agency (JAXA) said they hope to try again. "While we set up a new investigation team to study thecause and countermeasures, we will also review the Venus orbit injection planagain to take the next opportunity in six years when the Akatsuki flies closestto Venus," JAXA officials said in a statement. After more than six months of interplanetary travel, the$300 million Akatsukispacecraft got to within 342 miles (550 kilometers) of Venus Monday night.At 6:49 p.m. EST (2349 GMT), the probe began firing its thrusters in anorbital-insertion burn, which should have slowed the craft enough to let Venus'gravity snag it. After initiation of the burn, a communications blackout ?caused when Akatsuki swung behind Venus ? grew from the expected 22 minutes tomore than 1 1/2 hours, suggesting that somethinghad gone awry. While JAXA scientists managed to re-establish contact withthe probe, they announced Dec. 8 that Akatsuki had failed to enter Venus orbit.JAXA officials said that the thrusters failed to fire for long enough, burningfor only two to three minutes instead of the expected 12, Japan's English-languageMainichiDaily News newspaper reported. Akatsuki went into safe mode ? a sort of standby state thatallows craft to weather various technical glitches ? which shut down theengines, according to an article in the journal Nature. JAXA officials havedetermined that Akatsuki started spinning before going into safe mode,suggesting the probe may have been hit by some object or had a problem with itsengine nozzle, Nature reports. Akatsuki doesn't have enough fuel to slam on the brakes andreverse course now, so it will continue on its long, looping path around thesun. It should come close enough to Venus to try another orbital-insertion burnin December 2016 or January 2017, JAXA officials said. The probe should be able to survive until then, scientistssaid. Akatsuki was designed to operate for at least two years in Venus orbit,but its batteries can last for longer than that, and the spacecraft ?still hasmost of its fuel left. But JAXA officials are concerned that it could sustainheat or radiation damage on its trip around the sun, the Mainichi Daily Newsreported. Akatsuki was the second robotic Japanese probe ever sent tovisit another planet. Japan's first planetary mission, the Nozomi orbiter sentto Mars, also failed to enter orbit in late 2003. Akatsuki was supposed tostudy Venus' clouds, atmosphere and weather in unprecedented detail. "In so many ways, Venus is similar to Earth. It hasabout the same mass, is approximately the same distance from the sun and ismade of the same basic materials," Akatsuki project scientist TakeshiImamura said in a statement a few months ago. "Yet the two worlds ended upso different. We want to know why." But now researchers will have to wait six more years toaddress these questions ? if they get to answer them at all. And in themeantime, that delay is a blow to the astronomical community. "The Planetary Society regrets that the innovativeAkatsuki spacecraft seems to have missed its opportunity to lock into an orbitof Venus," Bill Nye, executive director of the space-exploration advocacygroup, said in a statement. "Although Akatsuki has already accomplishedsome remarkable things on its voyage, this setback reminds us how difficultspace exploration can be." 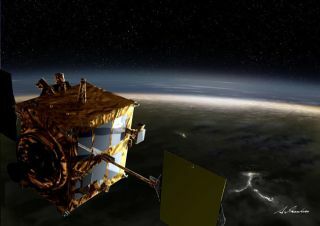 Akatsuki's mission would have complemented and built uponthe observations of Venus Express, a European Space Agency probe that has beenorbiting Venus since 2006. Akatsuki launched from Tanegashima Space Center in Japan onMay 20 along with the solar-sailspacecraft Ikaros. Ikaros became the first craft to cruise through spacepropelled only by sunlight, and it's still going strong.